At Dean & DeWitt Property Management, we want you to love living and owning in St. Petersburg, FL. One of the best ways to do this is by getting out and participating in your community. 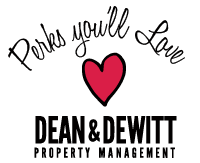 Our Dean & DeWitt Perks You’ll Love Program can help you love your community and love your rental. Being a tenant or owner with Dean & DeWitt Property Management entitles you to perks, promotions, coupons, & discounts to local restaurants, sporting events, special events, shoppes, and many more from our local business affiliates. Also, from time- to-time we provide short-term exclusive specials so check back to this page often. 10% Discount at Boaters Republic! As a member of the Dean & DeWitt family, please use this link for exclusive 10% OFF Boaters Republic merchandise! Use this link and a 10% discount will automatically be added to checkout in the final window before purchase.